Today's post is a guest post. I haven't been able to post as much, or prepare anything for a few weeks so I asked my buddy Greg Brooks to fill-in. Greg is a Dolly Grip's Dolly Grip. His credits include: the Showtime series Californication, and the Clint Eastwood films, Changeling and Gran Torino. He knows his stuff, you should listen to him. A big part of what we do as dolly grips is operate camera cranes and jib arms. These too require the same soft touch and subtle corrections as a dolly but now you have to fight (or befriend) gravity and inertia. It can be quite challenging. Often times you are on a wide lens and you can wing it and get it close, but often times you are not and pin point precision placement is key and settling that crane into an over from thirty feet in the air is a skill like any other that challenges us as dolly grips. I've learned a few key tricks that can aid you immensely as a "bucket guy." This of course refers to the guy that is operating the crane and doing the primary arm movements from the handles at the rear of the crane. First thing I do is try to pick the back corner of the bucket that is between the action and the crane. Once a number one position is established by whomever is calling the shots, depending on the ground surface, I'll give myself a T-Mark (like the ones we use for actors) on the ground so I always come back and stand in the same place. Any mark will do, but the key is to have your feet in the same place every time because the camera can look like it's in the same place from thirty feet away from different foot positions. Secondly I look up at the camera which is where your eyes are going to be focused and match a vertical or horizontal line on the camera or the head with a vertical or horizontal line in the background. Sometimes it's the front of the matte box or the base of the head or anything like that. Then you just look beyond those two things and see what they fall in line with. The trick here is to not mark off objects that can move!! This is a mistake that we've all made a million times. Sometimes you'll mark off the top of a truck that you're sure will never move and then the 2nd A.D. comes out right before they yell, "Rolling!!" and asks for that truck to be backed up five feet!! Always stick with inanimate objects. I can't stress that one enough. I've been burned more times than I can think and my B-Dolly grip and I always tell stories about the times we've been burned by marks. The other thing you can do as a back up or as a primary mark is measure off your own body since sometimes the only thing to mark your first position off of is blue sky. So I make a note of where the back handle rubs against my side and remember the position. This is handy, but way less precise when you get into the very tight shots that your number two position is often establishing. So once your number one position is established, there will always be a number two and sometimes a three and four. I use the same procedure for all. The floor marks are really key for me because you can step into the mark as you are swinging around and then shift your eyes to the camera and land it in the exact place that you want and already have your feet planted so you can use your upper body strength to softly slide the camera to it's last mark. This system works pretty well for me. Again, I'd like to reiterate something that is stated on this site many times about being a good dolly grip. The most important part of all this is knowing what the shot is trying to achieve and knowing your lenses and what the shot will see at all your positions. I look forward to hearing some new methods from everyone. A lot of times, if there's no sightline but blue sky, I'll "burn" a mark into the area of skin where the handles touch if they're not on a knee or some other identifiable spot. I just rub a finger back and forth until the friction heats up the spot. It lasts for a while, but people look at you funny. thanks for the chance, dude. By the way, I didn't do Six Feet Under. Can't take credit for someone else's nice work. I push on Californication for Showtime. I love the "burn" idea....Pain will make you remember that mark!! Sorry man, I fixed it. I could have sworn you did Six Feet Under! Thanks very much for the tips, Greg! be wary of lasers.....watch the actors. watch the camera. lasers are great for certain things, but the path from one to two is not always the same when you're tracking a bead of light on the floor. best bet is to look at the camera. Hey Eddie, as greg says , be very wary of lasers. They are not great tools for cranes, because of the path the camera flies through in 3D space. Sightlines are a far better way to work a crane. If you do use a laser, try and rig it so it points back at the crane column. Have a board on the column that has a line that you follow with the laser , that will allow you to move the arm through the correct path. Be warned. This is really difficult to do. I have only used it a few times, and always rehearsed the move. Greg - great post ! Is that you on the boat with the crane? Hi Sanjay. That's actually me on a show I did a couple years ago. 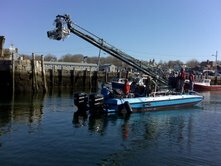 It's a 37' Phoenix arm mounted on a "flight deck" boat. It's got a Libra head. We took a beating but it worked. I agree about the lasers. I know a lot of guys that use them and they have their place, but I prefer to keep my eyes on the camera and use established sightlines. I'll often pick a "midway" sightline such as a window on a house or a tree that the camera has to pass through on it's journey and that helps me get there without taking my eyes off the action. Incidentally, Sanjay, There are some more shots of the crane on the boat at gentlemengrips.com. Just click on the "cranes" tab and enlarge the pics. Laser's do have their place. I didn't start using them until recently (last five years), but I find a laser beneficial to me in easily finding an established start mark, especially when you don't have the luxury to eye a set point where your camera is or the bucket is too high to get a body mark. It's also a good tool to confirm a concise final mark for the bucket to check yourself. Thanks for the advice, guys! I always feel like Luke in a room full of Yodas when I come on here. I haven't met John Flemming yet, but hopefully I will sooner or later!